A Victorian favorite accent plant, often surrounded by caladiums and coleus. Vick's 1904 Garden and Floral Guide listed Duchess of Edinburg with dark purple stems and leaves. Ours is a similar inky purple, the spiky seedpods just as dark as the leaves. A heat-lover, it does well in humidity, too. Poisonous. Lightly clove-scented frilled petals of deep maroon edged in white bloom on compact plants from summer to frost. Well-drained gritty soils suit this best, as does afternoon shade in warm summer areas. Eggplant-purple glossy leaves look great all summer long and add depth to container plantings. 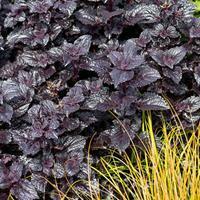 The foliage is thick and crinkled and super shiny, and flowers are scarce, making it a coveted new coleus for sun or shade. Intriguing in bud, for the papery overlapping bracts marked with tracery elegantly wrap the buds; and gorgeous in bloom as the jagged-edged petals burst forth to create a full-fringed flower in berry-stained colors. Pair with Agrostemma and Linaria for early summer abundance. A first-class cut flower too, perfect for attaching to your lapel! Self-sows. For the kid in us, a deliciously chocolate scented cosmos flower! The species was illustrated in Curtis' Botanical Magazine in 1883. This choice selection is more compact and flowers summer to fall. Maximum flowers in areas with warm days and cool nights. Grow in regular to rich well-drained soils; avoid wet clay soils as they may rot in such conditions. Develops a tuberose root that can be overwintered like dahlias in damp sand in a cool area. Keeping over will result in more robust plants the following years. A large creeping variety with soft fuzzy leaves with chocolate markings have the invigorating scent of peppermint candy! Use in mixed planters for foliage contrast and scent, placed strategically by the front door. An antique, small-flowered regal named after John Stuart, the third Earl of Bute, who became Prime Minister of England. It has velvety flowers of deepest burgundy, with fuchsia-pink penciled edges that set off the dark petals beautifully. A spring bloomer; protect from hot summer sun and rain. An easy to grow geranium with silvery gray puckered leaves in a neat rosette, and dark maroon flowers that sway at the tops of the delicate-looking but strong stems. An elegant variety perfect as a specimen in a pot. We love flowers, yes, but good foliage is essential for that perfect garden vignette. This gorgeous tropical deep rose hibiscus blooms too late for many up North; we have to be satisfied with the foliage only. But what leaves! They look like a bushy garnet red Japanese maple with serrated leaves. Grow in contrast with lime green and orange plants for that wow factor! Glowing with the deepest maroon color, these saucer-shaped single flowers look lovely paired with red hollyhocks and yellow flowers. An antique variety which was grown by Jefferson at Monticello. Summer bloom. Rich, moist soil. Biennial to short lived perennial. No garden designer's carefully considered garden plan can top this riveting combo of true red and deepest purple-black found naturally in summer blooming 'Black Truffle'. 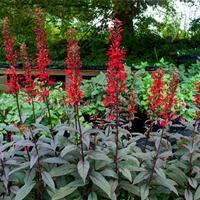 A selection of the green-leafed native, it thrives in moist soils and will draw hummingbirds from all around. Patented. The deepest colored nasturtium we offer, 'Black Velvet' has been selected for its mahogany colored blooms veiled in black. In Victorian times a similar variety was described as having dark blood-red flowers, and curiously emitting electric sparks in the evening! Once called Velvet Trumpet, fitting I think, as this selection has shorn velvet dark mahogany petals dotted with yellow pollen from the curving stamens. 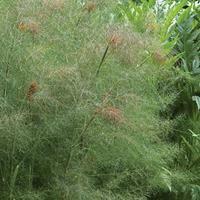 Tall, willowy and graceful, best in masses in cooler summer areas. We found it thrived in 80 degree weather here in CT.
Headliner™. 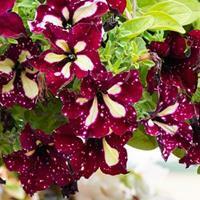 A fast growing, quick to bloom petunia like no other, with a corn-silk yellow star and spots on burgundy petals. The stars show up most vividly in cooler weather. In mid-summer trim by 1/3 and apply a fresh dose of organic slow release fertilizer for renewed vigor and blooms. Large, deepest purple, ruffled flowers on strong tall stems bloom in late spring. The flowers are very similar to double peonies. Self sows. A profusion of cut petals in burgundy and almost black. A showy addition to the early summer garden with cornflower 'Black Gem', and foxglove 'Apricot'. Self sows.